Captain Faruqui stood at the centre of his bridge with his hands clasped behind his back and a smile set onto his face while the reverse view of the ship was displayed on the viewer. They crept at barely a crawl from the asteroid as the minutes and seconds ticked away inexorably towards the destruction of his incursion shuttle. "Five more minutes to detonation." Goruss Clogg sneered from his console towards his commanding officer. The intelligence service was run on a strictly need to know basis and he had been selected to join the group who were deemed to need not to. It was true that he would have had many reservations about his task had he known what his orders would lead to. The captain had asked him to quietly mention to the merchants that there would be Latinum for them if they simply stayed out of the way. He had assumed, quite reasonably that his intention was to ensure a measure of co-operation, not to tempt them into a trap that would rob them of their lives. "Excellent." He replied, hardly hearing his security officers words. Clogg had been told that the Section 31 troops would have been beamed aboard the Violator but that had seemed not to have happened meaning that everyone remaining on the asteroid would be instantly killed. Clogg hung his head sadly, hating himself for allowing himself to have been blindly lead into such an unthinkable act and worse for leading others along with him. "As soon as we reach minimum safe distance send the signal to overload the warp core with a self destruct countdown." The Captain commanded. "When it detonates go instantly to warp, they’ll be too busy to track us with any luck and we’ll be back in Federation space in time for breakfast." "Sir!" Cloggs attention was suddenly roused from his self recriminations by a warning symbol on his terminal. "I’m tracking an incoming signal." "A ship?" He asked urgently, spinning round in surprise. "According to the scanners it’s a Scarab." Clogg said in agreement. "It’s coming in at high warp and isn’t cloaked." "How long to contact?" Commander Brown leapt up from her seat. "It can’t be the Ibex." Captain Faruqui groaned, his eyes rolling back in his head. "She’s closer than that." "If they’re coming in uncloaked then they want us to see them." Commander Brown shook her head in dismay. "They want us to drop our cloaks and raise our shields so they can see us." Clogg muttered to himself but loud enough for everyone to hear. "They can probably already see us. This could just be an attempt to intimidate us." The Captain told him firmly. "I don’t want to provoke them. We’ll wait until we know where we stand." "Tell me about the tubes!" Blake insisted firmly, glaring at the dishevelled scientist. "Tell us on the way." Compz interjected. "We have a bomb to defuse or nothing else is going to make much difference!" Blake remained motionless, breathing heavily as the anger bubbled away inside him. "Alright." He finally conceded. "Lets go." The group hurried along the narrow rock tunnel towards the main docking area. "What do the tubes do?" Katherine asked as they moved along. "Lots of subtle things." He replied. "It’s too complex to explain." "You better find a way to make it simple." Blake growled from the front of the group as his torch picked out the way to go with a flickering tongue of light licking across the uneven surface. "It goes back to the Scarab." He began. "We originally conceived the idea to counter the Borg threat." "The Scarab?" Katherine asked thoughtfully, trying to make sense of what she knew. "What was the idea?" "The idea to fight fire with fire." The doctor told her simply in a rehearsed monologue that he’d clearly given at several board meetings. "It all began with a captured vessel." "Not the Romulan ship?" Katherine smiled at the ridiculousness of her own suggestion. "Of course not." He agreed, growing slightly breathless from the exertion of trying to keep up. "If you intend to go to the hangars then I can show you." "They’ll be here soon!" Captain Graves assured himself verbally, as if hearing himself say it offered him some comfort. "I hope so." Morrow agreed, rubbing his temples that were throbbing from the effect of a few sips of Tarquarian gin. "Who knows how long we’ve got, or even if Haldo can fix it." "I know you can’t!" Graves told him. "And I couldn’t stop a core overload on the Wanderer, let alone a sophisticated military ship." "A warp core overload on the Wanderer would barely light a candle." Morrow smiled weakly at his own humour. "That’s true." He grinned back with a vague glimmer of hope that was far outweighed by the gravity of the situation. "Look!" Morrow yelled as a finger of light felt its way from the tunnels and the sound of familiar voices echoed through the chamber. "Thank god." Graves sighed to himself, throwing his head back in relief as a smile carved it’s way across his lips that just wouldn’t take no for an answer. "Compz." Winston called out, jumping up and down and waving his arms as the big man hurried over. "Hi guys!" He called back, anxious to tell them everything but forcing himself to remain focused for once. "What’s the situation?" "The hold is loaded with live and armed torpedo warheads and the crew have beamed back to the Violator." Graves told him quickly, leading him to the airlock. "The core is set to overload and the self destruct timer is counting down." "What have you tried?" 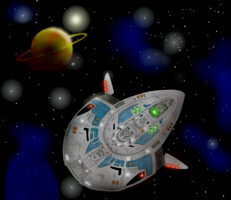 Compz glanced back to Morrow as he followed them to the Runabout. "We called you!" Morrow agreed. "That was the only idea we had." Haldo Compz nodded knowingly and glanced for a moment at the pair of inept men who were officers in honorary rank only. "You did the right thing." He told them as he stepped over to the airlock. Blake and the others walked over to the hatch as the others slipped inside the ship. "Is there anything you can do?" He asked, turning to Katherine. "Damn it Blake, I’m a doctor." She told him. "…Not an engineer." "What about you?" He turned to the scientist who had turned a very odd colour as terror gripped him firmly enough to drive rational speech from his abilities. "They would have reset the codes and locked the docking clamps." Katherine guessed. "I doubt there’s much any of us can do." "They’ve reset all the codes and locked down the docking clamps!" Haldo called out from the airlock. "Can you eject the core?" Blake asked with a hopeless shrug. "Yes, I can." Compz agreed. "But whether it’s attached to the plasma injectors or rolling around on the tunnel floor it’s still going to blow us all to bits." "Good point." He muttered. "Any ideas?" "Not good ones." Compz stepped out of the airlock towards them. "I’ve reset the clock to give us a little more time. The computer is confused by some very silly programs I added but it won’t keep it busy long, perhaps an hour at most." "He’s bought us some time!" Blake turned to the scientist. "Now it’s your turn to get us out of here." "Me?" He gasped, stepping back. "You said the Scarabs are based on technology from a ship you captured." Blake continued. "If it’s here then we can use it." "We can’t use it." The doctor shook his head fiercely. "Humans can’t use it." "I’ve had enough of this!" Blake rubbed his temples and turned from the terrified scientist. "I’m the highest ranking Starfleet officer here so I’m taking command!" "Fine with me." Compz nodded. "I’m happy so long as it’s not my fault when we all die!" "Then we’re agreed." Blake continued to cut off any further comments that could eat into whatever time they had left. "Me, Compz, and Jones are going to the hangars to find something we can get out of here on." Blake handed her a tricorder. "You take the others and find the Wanderer crew." "I can show you how!" Dr. Jones whimpered, pointing at the map on the tricorder screen. "Everyone stay in touch. Report anything!" He said as the groups separated. "Good luck!" The Scarab class vessel, Sphinx emerged from warp trailing streams of blue light from her outstretched nacelles that jutted from her sides like a pair of small wings. As she went to impulse the nacelles folded back behind her nose, the three indents along their length were glowing a fierce red from her Bussard collectors. Her hull was flat and rounded at the front with a stumpy oblong tail with the bridge module running down her spine and housing a dark engineering section with a glowing green heart. A large weapon jutted forwards from an alcove on her nose and two black indents at either side had deep red torpedo tube throbbing a dull red from their photon spill ports. "Oh my god." Captain Faruqui said as the image of the vessel filled his screen. "They’re pointing straight at us." Goruss Clogg told him. "They must have detected us." "Do we raise shields?" Commander Brown asked, her eyes glued to the screen at the fore of the bridge. "If we do that then we’ll have to drop the cloak." He said simply. "We don’t know for sure that they know we’re here." "The Ibex is de-cloaking." Clogg cried out. "It’s off our port bow, two thousand kilometres." "I guess they know we’re here." Captain Faruqui groaned. "Hail them…"
"What was this ship you found?" Blake asked as the hangar doors loomed in front of them. "It’s a long story." The scientist began, more used to laboratory thoroughness than explaining to a couple of angry men with phasers. "Then perhaps you better begin." Compz told him angrily. "Do you remember the battle of Wolf 359?" Jones asked. "The Borg cut through our defences with frightening ease, destroying around 40 ships." "I remember like it was yesterday." Blake told him flatly with a humourless smile. "Well the Borg Cube continued on towards Earth but it left something behind." Jones explained. "A kind of scout ship, apparently they often do it to act as sensor relays and to watch for their victims trying to escape. It helps gather information on the behaviour of a species and inform them of new species that might attempt to offer assistance." "Go on." Blake urged him, highly intrigued. 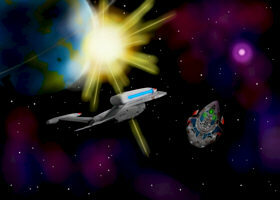 "Well the rescue team that followed the Cube encountered this scout ship." He continued. "Of course it cut the first ship to pieces but the entire fleet managed to damage it quite a lot." "That was a Borg ship?" Blake stopped in his tracks, facing Jones with shock and surprise. "A Borg scout fired on the Mirage?" "The Mirage?" Jones asked, furrowing his brow curiously. "I think that was it, yes." "Take my word for it." Blake growled. "It died when the Cube was destroyed, luckily for the rescue fleet." Jones shrugged. "We salvaged the vessel and classified the incident." "So the Scarab is a Borg inspired ship?" Compz asked while Blake seemed lost in his own inner torment. "Oh no." Dr. Jones dismissed the suggestion with a small laugh. 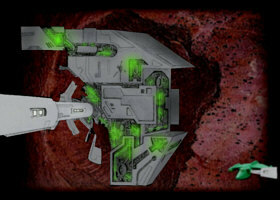 "It has Borg inspired propulsion and weapons but we can go much further with what we learnt from that scout." "Our original prototype used every piece of technology we could make sense of." He replied proudly. "Computers, materials, nanoscopic robots flooding the super-structure repairing damage instantly." "What happened to it?" Compz asked, listening raptly. "Nothing." Jones admitted with a hint of regret. "It just didn’t work." "Why not?" Compz leant forward to the scientist so that his breath could be felt across his face. "We never knew." The Doctor told him. "Nothing worked, the whole system refused to initialise. That was when we changed direction and designed the Scarab." "The Scarab is just a stopgap until you can assimilate all the Borg technology?" Compz suggested. "Yes." He agreed enthusiastically. "We use them to test every advance we make, one step at a time. At first we were too excited by what we had so we went back to basics to find out where we went wrong." "Where is this Borg ship?" Blake growled menacingly. "Behind that door." Dr. Jones replied quietly, unsettled by the sheer hatred facing him. "Why didn’t you destroy it?" Blake sneered, stepping up to the door as he pushed the doctor aside. "We needed to learn from it." He replied simply. "We couldn’t waste such an opportunity." "Opportunity?" Blake said with contempt. "Without that scout we’d have no Tri-cobalt warheads, no Quantum Torpedoes, no pulse phasers." Jones explained in an attempt to vindicate his position. "He was at Wolf 359!" Compz told him flatly. "I see." Dr. Jones replied with a nod of realisation as he turned to the young officer. "Then I can imagine why you hate the Borg but you have to see that having this gave us the advantages we needed to defeat them the next time. "They came back?" Blake asked, his brow furrowed over his aggressively pitched eyebrows. "They did." He nodded, his own brow wrinkled curiously as he wondered why he wouldn’t know. "We learnt enough from this ship to covertly improve our weapons across the whole fleet." "I died at Wolf 359!" Blake sneered at him. "I woke up in one of your damn tubes, the recipient of your procedure." "That’s impossible." Jones smiled, turning his head to face Haldo, assuming he was joking. "There are 13 levels." He began. "Level one is just a scan but level 6 erases the memory of the subject before they’re reprogrammed. How would you know who you are?" "I was taken out at level 5." He replied in disgust. "It’s dangerous to remove someone until the program is complete." He offered weakly, hanging his head. "You were turning me into a Borg, weren’t you?" Blake sneered, hardly able to look at the doctor for fear of losing his temper with him. "We created a Federation version of the Borg nano-probes." He told him with a lowered voice. "They make detection impossible and increase your brain and musculature to a superior level, increasing your strength and intelligence. Chips are added throughout the brain to augment it’s functions and a replicator net is set into your right hand." "And a phaser in the left..." Compz added knowingly. "When we built the prototype there was a lot we didn’t know and the same is true of what we were doing to you." He admitted. "When we heard our tubes had been found at Huttus 12 we had new ones delivered here so we could carry on. We didn’t know exactly what would happen and we only intended to do it to the bodies of deceased Starfleet officers and crewmen, we honestly didn’t think we were doing anything wrong.."
"It always sounds reasonable." Blake shook his head sadly. "I’ve found them." Katherine said, smiling as her tricorder flashed up the whereabouts of the 12 missing Wanderer crewmen. "Great, I can’t wait to get out of here." Morrow rubbed the top of his arms as the cold air began to chill him. He noticed that he could see his breath as it left his mouth and knew the temperature must be falling rapidly. "I take it life-support has failed?" "Just about everything has failed." Katherine agreed. "We could go back to the shuttle." Graves suggested dryly. "It’s going to get hot there soon." "I’ll be fine." Morrow assured him with a shudder. "This way." She ushered them into a large hall where 12 of the tubes were jutting from the floor. "My crew are in those?" Captain Graves asked, slightly horrified at the sight of the intricate machinery that was working it’s way into his peoples bodies. "They are!" She agreed a little surprised. "I can scan them!" "I guess they’d only just started…" Morrow suggested. "They haven’t started anything." She glowered accusingly at the merchants. "They all died in your escape pods from asphyxiation." "All four pods failed?" Graves asked. "Isn’t that a little unlikely?" "Not if you remove the power supplies to run the coolant generators around the gin!" Morrow sighed, slapping his forehead in realisation at what they’d done. "I’d forgotten about that." Graves pulled an apologetic face at the Ensign. "They’re alive, they haven’t done anything to them yet except repair the damage." She told him sternly. "They’re unconscious but should come to if you open the doors." "You know there’s two more of these on the shuttle!" Morrow told her as they walked to the first of the tubes. "Oh no!" Katherine cringed as she remembered the two tubes that Turaz had been tinkering with. "No loose ends." "Nothing." She sighed, throwing a hypo-spray to Morrow. "Inject each of them in the neck and they’ll be fine. Go as fast as you can and then get them to the hangar, I’m going back to the shuttle." "Do we have time?" Graves called after her as she hurried out. "I hope so." She called back. "I suggest you don’t tell them about the power supplies!" "They have responded to our hails." Goruss Clogg reported as a light began blinking on his console. "Incoming message." "On screen." Captain Faruqui ordered in a slightly subdued manner as if someone had purposely urinated on the burning flame of his enthusiasm. The viewer flashed from the image of the Sphinx to the face of her commanding officer. She was younger than he had expected and had the casual gait of someone who knew that the fight was already won before it had even begun. The Captain sat at her post, just looking at the reserved panic going on aboard the Violator with some amusement before she bothered to stand. Finally she deemed to speak and stood before the viewer, adjusting her black uniform absently as she did as if the Starfleet intelligence vessel posed no more discernible threat than an insect buzzing around a lion. "Your cloaking technology is interesting." She began with an icy grin. "It should be in a museum." "What do you want?" Captain Faruqui scowled. "Now, it’s you that raided our base." She reminded him. "Clearly it is you that wants something." "I got what I came for, now I’m leaving with it." He told her with a fierce resolve that appeared to worry his senior staff who were clearly wondering how he planned to implement his brave words. "How are you going to achieve that?" She goaded him. "You’re out of your depth and drowning fast." "We’ll see." He growled back. He quickly turned away from the screen and made a cutting gesture at his throat to signal his desire to have the audio part of the signal muted. "How long until our shuttle explodes?" "Any minute now." Commander Brown told him under her breath. "I’ll keep them talking." He began, still with his back to the screen. "As soon as it goes up raise shield and fire everything we have at those two ships. Hopefully it will catch them off-guard." "Yes sir." Goruss Clogg agreed. Captain Faruqui turned back to the screen. "We’re both Starfleet." He began with a knowing grin. "You’re not going to destroy me." "Don’t bank on it." She assured him. The hangar bay doors slid open and Blake Girling walked gingerly through onto the observation platform. The bay was a gargantuan cavern scooped out of solid rock at the heart of the asteroid with scaffold towers supporting the gigantic forms of the many docked vessels. Blake peered into the gloom through the transparent aluminium glazing in search of the Borg vessel. "It’s there." Dr. Jones told him, pointing out into the distance to a massive grey structure. The scout ship was a long oblong of dark plated metal with a deep hole at the bottom that showed off the random mass of machinery inside that spilt from it’s rear. Two outriggers jutted from the sides of the hull with more jumbled structures winding together within and the only light that picked it out came from the rigging that held her. "So that’s it?" Blake sneered. "Its construction is less generalised than a Cube." The doctor explained. "The outriggers contain a pair of redundant power sources that seem to provide the propulsion." "We don’t care." Compz cut him off before the scientist in him forgot that their lives were in imminent danger and began waffling on about nothing important. "Will it work?" Blake asked. "The power sources were removed for analysis and never replaced." The doctor replied. "We tried to copy them using Federation technology." Compz shook his head as the hopelessness of their predicament began to overwhelm him. He leant his hands against the glass and stared out at the ships in the hangar. The bright green Bird of Prey was visible in the distance with it’s wings tucked up for landing on one of the service pads and the port nacelle was missing from the tip and had been disassembled next to the ship. "What about the prototype?" He said as hope taunted him once again. "The first ship you made?" Blake agreed. "Where is it?" "It’s at the end of this gantry." He replied shaking his head. "You can’t see it from here." "Is it complete?" Blake persisted. "It doesn’t work!" Dr. Jones said firmly. "We can’t even make the lights come on inside." "Compz?" Blake shrugged his shoulders. "I can try." He nodded with a huge leathery smile. "Anything beats standing around waiting to die." "Why hasn’t that damn ship exploded?" Captain Faruqui grumbled under his breath as he tried stringing along the Captain of the Sphinx. "We have a problem!" She began. "Really?" He asked, turning to face her with an open expression of interest. "I want our computer core back." She told him. "You won’t be able to decode it anyway so it’s of little use to you in any case." "I’m sure you do." He smiled. "I could simply destroy your vessel but I don’t really want to do that." She continued thoughtfully. "You’ve erected a force-field around it to stop me transporting it out but if I damage your vessel sufficiently that will drop. I could board your ship but don’t want to cause a running fire-fight." "And of course you can’t beam a team here without lowering your shields." He reminded her. "Oh please…" She waved her hand dismissively and wiped the smile completely from his face. "I think the fairest thing would be for me to give you ten minutes to send me what is mine and then I’ll have no choice but to proceed with more forceful methods." "Mute audio." Captain Faruqui instructed, spinning to his officers. "Why hasn’t that shuttle detonated yet?" "Compz may have deactivated it." Commander Brown suggested with a knowing sigh. "Hack in to the computer, get me answers and blow that damn station up." He instructed. The doors to the prototype ship opened with a hiss and a rush of cold stale air. "It smells!" Compz told them redundantly. "We couldn’t activate the systems." Jones reminded him. "We had to install portable heat and air generators so we could go aboard." "It doesn’t matter." Blake reminded him. "Get on board and see what you can do." "Where are you going?" He asked as Blake headed off in the opposite direction. "I’m going to see what’s keeping Katherine!" Katherine worked frantically with the second tube door which resisted her with equal resolve. The other was open with a woman inside groaning softly from her injection of stimulants that had so far failed to rouse her to consciousness. She was pale and gaunt in much the same way that Blake had been and her hair had completely gone, the only reminder that it had ever been there were the few dark threads spread around the inside of her cylinder. "Damn!" She cried out in relief as the door finally unlatched and swung open with a shuddering opposition to her efforts. There was a man inside, darker skinned but still human and larger built than Blake although his skin looked drawn and taught against his lean musculature. She quickly injected the compound into his neck and sat back wearily, hoping they would revive quickly. "Come on…" She gasped as the seconds ticked away. The verbal countdown was stammering around the shuttle, reaching the last few seconds and then bouncing back up to several minutes in it’s confusion caused by Compz additional programming. "Please come on!" She closed her eyes. "Please wake up..."
Captain Graves led his weary crew towards the hangar bay with Morrow constantly barking at them to speed things up or die in a flaming barrage of instantaneous annihilation. "Graves." Blake called out. "Come on!" "We’re on our way." He assured him loudly. "These people are tired, you know." "Did you catch up with Ensign Rogers?" Morrow called out. "She went to the shuttle." "The shuttle?" Blake shook his head in disbelief. "The shuttle with 6 armed warheads and a warp core about to breech?" "That’s the one." Graves grinned. "Why did she go to the shuttle?" Blake sighed. "There was two more tubes on it." Morrow told him as he tried bodily dragging along two stragglers. "With people inside?" Blake snapped. "I saw people inside." Graves assured him. "Go to the hangar bay, we’re hoping to get a ship working to get us out of here…"
Compz followed the circle of light cast by his torch into the bowels of the ship with the errant scientist behind him. "Basically this is just a skeleton." Dr. Jones told him conversationally. "It doesn’t really have any bulkheads or anything yet. It’s just a network of replicators and field generators with some very clever little bits of equipment dotted around. "I can tell." Compz replied without interest. "It has everything to make it work but it just didn’t." He explained as if his mouth might seize up if he stopped moving it. "I keep feeling like perhaps we forgot something. Something so simple that it never occurred to us." "I get the impression that you’d be unlikely to miss the simple things." Compz goaded. "Where do you intend to start?" Jones asked. "We don’t know where the fault lies, perhaps in the engine room or the main computer or even the bridge?" "I wonder." Compz looked him over sarcastically. "I wonder where the fault could possibly lie." "It’s called the Corinthian." Jones carried on regardless of anyone listening. "Really?" Compz continued, feeling and blundering his way along the corridor. "Once it’s fully active the replicators will generate all the panelling along the interior." He noted as Haldo slipped on a loose pipe. "Of course we never actually finished any of it." He just carried on. "It’s inspired by Borg design but definitely a Federation ship. The outer shell is going to be fully plated with armour." "What does it look like?" Compz asked, hoping that if he wouldn’t shut up then he could at least tell him something interesting. "It’s very pretty." He said simply. "An elegant design, very slender. If it’s the engine room you want then here it is!" "Katherine?" Blake called out as he entered through the airlock. "Blake?" She cried out in relief. "I’m in here, the cargo pod." "What’s going on?" Blake asked as his head poked through the access portal. "They won’t revive." She told him. "I opened the tubes and gave the stimulants but they just won’t wake up." "We have to get out of here." He said, cutting her off. "This ship could literally blow any second." "We can’t leave them here." She argued, pointing back to the helpless figures. "Alright." He agreed, rubbing his temples thoughtfully. "We’ll beam them to the Hangar platform with the shuttles transporters and deal with them there." "Yes!" She replied with a sigh of relief. "And then beam ourselves." "Perfect!" He replied. "Put a comm badge on each of them and then all we’ll have to worry about is whether Compz can get that prototype working to get us out of here." "Prototype?" She called out as Blake scrambled off to the transporter controls. "The ship that attacked the Mirage was a Borg scout ship." He explained as he located their signals. "They captured it and built a federation version but it never worked. They built the Scarab class from it." "They used Borg technology?" She repeated in disbelief. "It’s self-replicating, there’s no way to safely work with it." "I don’t think safety was foremost on their minds." He nodded as the two people in the cargo pod dematerialised. "Give me a comm badge and we’ll get the hell out of here." "There is power." Compz said rhetorically as he scanned the engine room with his tricorder. "The mains are offline but energy is being fed to the systems." "I know, everything should be working." Dr. Jones agreed. "It’s as if nothing knows what to do." Compz told him. "And yet the computer is fully operational." He shrugged. "I spent years studying this, I don’t see how we’re going to get this thing working in the few minutes we have." "We’ll do it because we have to." Compz told him as he adjusted his tricorder. "I take it there’s Federation programming in the computers?" "That’s right but it is compatible with Borg computer systems." Jones dug his hands into his hips grumpily. "We thought of everything." "You missed something." Compz grunted in reply. Blake materialised on the hangar observation platform near the airlock in front of the two people from the cylinders who were laying motionless on the metal plated floor. Captain Graves and the others were making their way slowly along the gantry towards them and waved as they caught sight of one another. "Katherine." Blake pointed at the approaching crewmen. "Get them to help you aboard with these two. I’m going to find out what the ship status is." "Ok." She agreed, tapping her foot impatiently as the seconds ticked away on the shuttles self-destruct timer. Blake stepped up to a narrow platform that had been hastily assembled in front of the airlock to the ship. Everything about the base had a utilitarian feel, brashly assembled from engineering kits designed to be thrown together and disassembled fast. The airlock doors hissed open and he stepped into the darkness. Suddenly a brilliant white light exploded behind his eyes, his mind erupted violently in pain and a fury of splintered images. Memories kicked up by a cyclone of though swirled through his synapses, disjointed forms of things he’d seen or imagined, brilliant colours permeating his essence and dancing wildly around his mind. He slumped to the floor, barely noticing the hard metal plating as he cracked his knees hard onto it. He groaned as his mind surged with the energy that suddenly flowed through it. In an instant his memory showed him as a child. His father had taken him to the gigantic Earth starbase. He’d watched in silent awe as a Constitution class ship had slowly backed towards him to dock at the waiting platform inside the cavernous interior. His mind lurched forward to the specifications of the Defiant class battleship, he saw himself sitting a desk, reading through files. He saw the corridor of the Mirage as he ran towards his death, the flaming energy of a Borg weapon as the bulkhead tore through his head, ripping his life from him to be later returned by the same technology. He opened his eyes, not sure any more where he was, or even who he was. The corridor was lit and grey panelling was beginning to form in the hazy silvery light of a replicator generator. He felt something growing inside him, a kind of energy that wafted through him, feeding him information and power. He knew every inch of the ship, inside and out. His mind felt its way into the computer core, accessing every gigaquad of data that had been fed into the drives, he felt the hull as electrical fields tingled through the structure generating hull armour and systems the engineers had never understood. He stood up to watch in silence as his ship came to life. "My god." Compz muttered as the main power system hummed gently to life. A huge glowing ball, illuminated softly in blue as a faint tendril of energy snaked lazily through the centre. The light picked out the engineering equipment, pipes and conduits plumbed unevenly into the glowing heart of the ship, feeding it with raw materials as the ship sucked them in and converted them into unspeakable amounts of pure energy. "What did you do?" Dr. Jones gasped, his eyes wide in childlike amazement. Suddenly with a crack the faint tendril running through the core sparked to life and a tunnel of white light cascaded upwards from the injectors and the whole ship rumbled to life, light flicked on and replicators began humming as panels, flooring and other parts began to form themselves. "I told you I could do it." Compz told him uneasily, slowly folding away the tricorder and wondering what the hell was going on. "You did it?" Jones muttered softly, spinning around in wonderment as his life’s work unfolded before him. "Actually." Compz admitted. "I didn’t do anything…"
"Time is up." The Captain told him sternly. "Wait!" Captain Faruqui replied anxiously, furiously struggling to find anything to talk about while his staff hacked into the insurgence shuttles computer and hurried up its self destruction. "I’ve waited long enough." She replied haughtily. "Beam the computer core out immediately." "You’ll have to lower your shields." He said, his eyes lowered in defeat. "Just beam it into space." She told him with a viscous smile. "I’ll do the rest for you." "Begin transport." He shrugged to his security officer. "I have the codes locked in." Goruss Clogg told him. "I have found them and am ready to transmit at your signal." "Excellent." Captain Faruqui replied with a grin, knowing exactly what he meant. "Go." Goruss Clogg pressed the button that connected his console to the shuttles destruct timer and completed the sequence manually. Suddenly the base erupted in a flash of anti-matter that lit up the bridges of the Violator and both Scarabs. The blast of energy vaporised the asteroid as the warp core and all six warheads exploded with an incredible destructive yield. The secondary blast tore out with a ring of power, shattering the entire asteroid belt and blowing chunks of super-heated rocks cascading furiously out into space. The Violator dropped her cloaks and raised her shields in the few seconds of surprise and fired a volley of quantum torpedoes into the two stunned Scarabs. 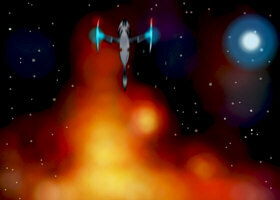 White bolts of energy erupted on their shields and arcing blue bolts flashed across their hulls. "Plot a course out of here!" Captain Faruqui growled triumphantly above the scenes of devastation playing out on his view screen. "Engaged!" The helmsman replied, understanding the urgency of the situation and pre-empting the command to engage the drives. "I’m detecting another ship closing." Goruss Clogg shouted above the red-alert klaxons. "Closing fast!" "Reverse view on screen." The Captain barked. 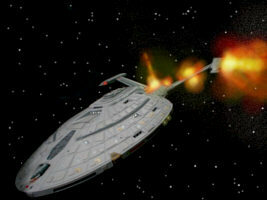 "Arm photon torpedoes." A small ship tore out of the flaming wreckage of the asteroid, its engines glowing a deep blue across it’s unfinished exterior. It flew effortlessly through the rubble that rained out behind it, rocks skipping across its impenetrable shields as the vessel screamed towards the Violator . "They’ve beamed something aboard!" Clogg cried out in surprise. "Its in hangar bay 1!" "Erect a tactical shield around shuttle-bay 1!" Captain Faruqui cried out. "Now!" "Shields up, sir." Clogg confirmed nervously. "I can’t beam it out unless I lower our shields." "What is it?" Commander Brown called out. "Oh god." Goruss Clogg swallowed hard. "It’s our shuttle. Scanners show it’s missing the warp-core and the torpedoes but the self destruct charges are still on board and the timer is running." "Cancel it." Captain Faruqui called out, his voice low and hard, already knowing it would be hopeless. "Too late." Clogg confirmed his fears. 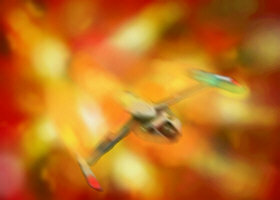 A blast echoed through the rear of the Violators hull between her nacelle pylons. The shield contained most of the explosion but not all of the energy. The body of the shuttle tore itself to pieces as the charges erupted, showering the bulkheads with flaming chunks of burning metal and shattering the power conduits that lay behind. The Violator slowed down as power instantly stopped being fed from the warp-core, the shield struggled to contain the broiling energy while the radiator grills flickered and the ship lurched in space. Suddenly the hangar doors exploded, torn from the bulkhead and thrown out into space before a flaming barrage of shrapnel. The hull buckled from within as a power conduit blew out, tearing a streak of flaming panels out along the rear of her crippled hull. The two Scarabs began to move in, surprised but not seriously hurt from her attack. Suddenly the Corinthian shot between them. Her tadpole shaped hull had two elegant protrusions from her nose supporting two engineering nacelles that throbbed with broiling blue plasma. Her body was open in most places to show the intricate Borg inspired engineering beneath her strong armoured shell that was surrounded by walls of potent energy. Her nose held a massive ion weapon and a launch tube beneath. She pirouetted between the battleships with ease as if taunting them with her speed and manoeuvrability. The weapons of the two Scarabs erupted as they both fired on her at once. "Shields are holding." Katherine called out from a control panel at the rear of the small bridge. "Don’t ask me how." "I know how." Blake assured her calmly from the centre, his mind directly connected with the ships computer and systems. The other two officers from the tubes sat at the front of the bridge behind the helm and operations control systems, their dark eyes faced silently forwards while their fingers danced with confidence over the controls. "I can’t activate the weapons." Doctor Jones called out in mild panic. "I can’t even see how to bring on the viewscreen…"
"Sorry." Blake smiled. "I forgot you couldn’t see out." As he spoke the front of the bridge vanished. The structure was low and had curved, sweeping columns supporting the roof, the front three sections of the wall suddenly became seamless holograms of space with the image of the two attacking Scarabs coming at them from opposite sides. "How are you doing this?" Katherine gasped. "This is Girling." Blake said as he stood up. "Compz here." A reply called out from nowhere. "We have full power?" He asked. "Everything is running perfectly down here." Compz nodded happily as the spherical generator glowed brilliantly with a broiling snake of energy crackling through it. "Not that I have a clue about how any of this is meant to work." "Good enough for me!" Blake assured him. "What are you going to do?" Katherine asked, craning forward from her terminal. "You’re about to find out." He grinned. The Sphinx fired a stuttering beam of phaser energy from her nose cannon, the bolts careened across the Corinthian's shields as she rolled away, leading the attackers with her. From several of the exposed engineering sections on her bow beams of blue energy licked out at the two ships, connecting perfectly with both. Arcs of electricity blasted across their shields as their energy matrix was destabilised by the powerful tractor beam that pulled them both around as she flew between them. The Sphinx continued firing harmlessly at the little ship while she streaked past before suddenly vanishing in a blur of warp energy. The pulses carried on blasting out before the Scarab could tell what was happening and tore into the motionless Ibex, ripping through her collapsing shields and unprotected hull beneath. The surface of her nose erupted in fire as the pulses shredded her armour. The Corinthian appeared behind the Sphinx in a flash as she emerged from warp, she fired another blue energy damping beam into the rear of her engineering alcove and with a shudder of crackling energy the glowing green power source winked out plunging the ship into darkness. "I never had to fire a shot!" Blake told her as he turned to the bemused expression set onto Katherine’s face. "How are you doing this?" She asked more insistently. "I don’t know." He replied earnestly, ruffling his brow for a way to explain. "It’s like I’m connected to the machine, I can hear it talking to me and it hears me talking back. It’s not like a language, more like just suddenly remembering what you haven’t really forgotten." "There are several cerebral interface circuits in your brain." Dr. Jones nodded in agreement with him. "They were meant to allow the crew to communicate together more efficiently." "They work." Blake told him. "I can hear the other two as well." "They’re spooky." Captain Graves shuddered. "They just opened their eyes and wandered onto the bridge when we brought them on board." "How does it feel?" Katherine asked, shaking her head slightly in wonder. "It’s alright." He told her. "It’s not invasive." "Are you sure you’re ok?" She persisted. "It’s not perfect." He shrugged. "I can’t see everything at once but I can access all the information in the computer, the tactical scenarios, the data files. I can think with the assistance of the most powerful computer the Federation has ever built so I’m finally as smart as I always told everyone I was." "We filled the computer with everything." Jones told them. "We wanted to test its capacity, we put in every Section 31, Romulan and Federation file ever written. "Open hailing frequencies." He said for the benefit of those who could only hear with their ears. "And get Compz up here. He’s going to enjoy this." "Damage report?" 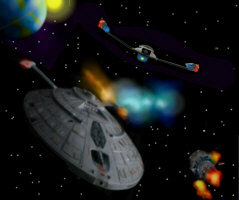 Captain Faruqui cried out as his ship listed helplessly in space. 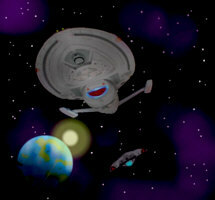 "Main power feed to the nacelles is gone." Commander Brown called back. "Emergency fields are holding us together for now, engineering teams are responding." "How could they do this?" The Captain called out over the buzzing warning sirens and the occasional flash from a console as power systems overloaded. "With consummate ease." Blake Girling assured him as he appeared on the viewscreen. "You did this?" Faruqui growled, turning in his rage towards the image. "Actually you did!" Blake reminded him. "I just returned something you lost." "You attacked us!" He grunted, his face flushed with rage. "You would have killed everyone on that asteroid which almost included us." Blake told him calmly. "I never fired a shot at you." "Weapons!" He growled. "Lock on to that ship." "This is getting us nowhere." Blake sighed and rubbed his forehead in exasperation. Suddenly Captain Faruqui vanished in a brilliant flash of energy. "Welcome to the Corinthian." Captain Graves waved at Faruqui as he appeared on the bridge of their vessel. He looked around in surprise at the dark gothic structure of the ship with sweeping columns and soft, gloomy lighting. "Send me back to my ship." He insisted. Suddenly, in a blue flash the Captain of the Sphinx arrived to stand next to him. She spun in surprise, glaring around her. "Patricia?" Morrow stood up in shock. "What the hell are you doing here?" "Winston?" She gasped. "Why aren’t you in uniform?" "I dropped out…" He stammered. "You’re the captain?" "This is your sister?" Blake frowned, jabbing his thumb towards her slightly dishevelled and highly surprised form. "I’m afraid so." He admitted before turning back to her. "I thought you were in trouble." "She is now." Blake told her with a stony severity as he turned to face the two captains. "You both are." "I demand…" Began Captain Faruqui. "You are in no position to demand anything." Blake cut off his words with a raised hand. He crossed his arms over his chest and began shaking his head in disappointment as if preparing to scold a small child. "What do you intend to do?" Captain Patricia Morrow asked, accepting her position with a willingness to hear him out at least. "You two disgust me." He said simply. "You should be ashamed of yourself." "Me?" Captain Faruqui gasped, pointing at his chest in disbelief. "All I’ve done is to turn your actions against you." Blake told him bluntly. "Your ship is helpless because I gave you back a shuttle you planned to use to kill hundreds of Section 31 personnel, it was too late for me to do anything but leave the warheads behind with the core and beam the people from the bunkers aboard the two Scarabs. You should think yourself lucky I didn’t send the core to you!" "I hope you don’t expect me to thank you!" Faruqui grumbled his reply. "And you." Blake turned to Captain Morrow. "You shot the Ibex to pieces. I would have invited their captain to join us but he’s a smouldering burn mark on his bridge carpet now." "I can’t believe how low you’re willing to sink." Katherine sneered at her former captain. "You’re a murderer." "I had a job to do, young lady." He growled. "The job of a Starfleet Captain never included this level of disregard for human life." Blake told him. "You’ve lost your way." "You’re ten years out of date!" Faruqui grunted his reply. "You don’t know anything." "I know that Starfleet wouldn’t sanction your actions." Blake shrugged. "I know your career is over when I hand in my report." "Your report?" He asked, taken aback. "I’ve just been promoted to acting Captain." He retorted. "I always said I wanted to make Captain before I reached 30 and now my cells have regressed a few years I figure I finally made it." "I declare you fit for duty." Katherine crossed her arms and smiled knowingly. "The word of my chief medical officer." Blake told him. 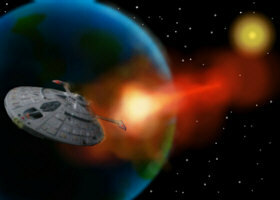 "Starfleet are going to be very interested when I dock at Earth with this ship." "You can’t go to Earth with our prototype." Captain Morrow scowled. "We have every piece of data about the entire history of Section 31!" Haldo Compz told her from the doorway with a raise of the piece of his forehead that would have included an eyebrow if he were fully human. "I would say your organisation is finished." "You destroyed yourself." Blake continued. "People like you always do. You don’t care about people so the people you tread on come back to haunt you eventually." "My investigation found Blake, he found this ship with all the evidence we could ever need." Compz agreed. "You built the weapon that finally finished you off." "I finished them off!" Faruqui told him. "Hardly. You just forgot the founding principals of Starfleet." Blake sneered at his bottomless reserves of arrogance. "If someone throws a rock at you and you throw one back then next time they’ll just find a bigger rock." "What do you mean?" He crossed his arms and turned away. "He means that Section 31 grew in power because you started an arms race with them." Compz told him. "You diverted your energy to fighting yourselves when there were real threats out there and real opportunities." "I thought we’d learnt to solve our problems without turning to violence but now you’re building battleships, sending armed shuttles after merchants and destroying each other in a vain effort to destroy a ship you hadn’t even managed to identify." Blake said with a note of regret. "When you dock this ship in section 01 at Earth then maybe it will remind them." Captain Graves stood up and shot back a gulp of gin. "I hope so." Blake smiled back. "Because we’ve got too much to lose if it doesn’t." "What are you going to do with us?" Captain Morrow asked, her eyes fixed downwards. "I’m going to leave you here." He told them flatly. "Your ships are damaged. The Violator isn’t going anywhere, the Sphinx engines were disrupted at full power and the Ibex has big holes in it, none of your ships are in a fit state to follow me." "I suggest you work together." Compz called out. "And I suggest you work quickly before Starfleet gets here to impound your ships and place you all under arrest." "But for now…" Blake said, stepping forwards to the hapless Captains as he crossed his arms over his chest. "Get off my ship!" They instantly vanished in a flash, returning to their own bridges. "So what now?" Katherine asked, leaning back from the terminal. "We do what I said." He shrugged. "We go home?" Morrow suggested with an eager smile, rubbing his hands together at the thought of returning to Earth. Blake looked back to Katherine and Haldo before spinning round to the two assimilated officers. He rolled his eyes up and along the support joists that led to the holographic viewer and peered at the nose of his ship. "I already am home." He replied.